Pio Abad (b. 1983, Manila, lives and works in London) began his art studies at the University of the Philippines before receiving a BA from Glasgow School of Art and an MA from the Royal Academy Schools, London. 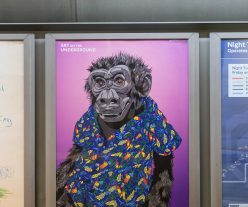 He has recently exhibited at Centre for Contemporary Arts, Glasgow (2016); 4A Centre for Contemporary Asian Art, Sydney (2016); EVA International Biennial, Limerick (2016); e-flux, New York City (2015); Asia Art Archive, Hong Kong (2015); Museum of Contemporary Art and Design Manila (2015); Gasworks, London (2014) and Jorge B. Vargas Museum, Manila (2014). Current and forthcoming projects include group exhibitions at Kadist, Paris and Para Site, Hong Kong and solo presentations at Art Basel Encounters, Hong Kong; Silverlens, Manila and Oakville Gardens, Ontario. 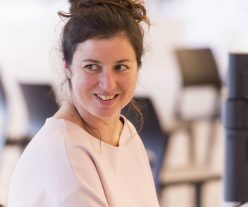 Lily van der Stokker (b. 1954 The Netherlands, lives and works between Amsterdam and New York) has exhibited extensively in both Europe and the U.S. 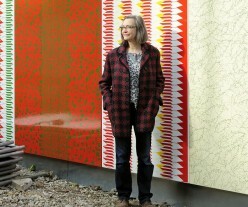 Her most recent exhibitions include The Green Checkered House, Beaufort Triennial 2015; Hammer Projects: Lily van der Stokker at the Hammer Museum, Los Angeles; Sorry, Same Wall Painting at The New Museum, New York; Terrible at the Museum Boijmans, Rotterdam; To The Wall with David Shrigley at the Aspen Art Museum; and Plug In #52 with Jim Iserman at the Stedelijk Van Abbemuseum in Eindoven. She is the subject of It Doesn’t Mean Anything, But It Looks Good, published on the occasion of her exhibition No Big Deal Thing at the Tate St. Ives in Cornwall. Van der Stokker has been commissioned to produce numerous public works, including Kalm nou maar…(Don’t Worry), Rotterdam (2013); Celestial Teapot, Utrecht, Netherlands (2013), and The Pink Building, Hannover (2000). In 2018 she will have a solo exhibition at the Stedelijk Museum, Amsterdam. Eduardo Paolozzi was one of Britain’s most influential post-war artists. His varied work, both complex and sometimes playful, defied artistic categories. He was chosen to exhibit in the British Pavilion at the Venice Biennial no less than five times, and displayed his artworks regularly in international exhibitions. His many accolades included a Knighthood, which he received in 1989, following his appointment as Her Majesty’s Sculptor in Ordinary for Scotland. 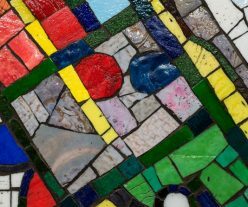 Artworks by Paolozzi are in the collections of public galleries around the UK, including the Tate and Victoria & Albert Museum in London, and the Scottish National Gallery of Modern Art in Edinburgh. From an early point, Paolozzi played a significant role in art education, holding posts at the Central School of Arts and Crafts and Royal Academy of Arts in London, and at the Hamburg Hochschule für Bildende Künste and the Munich Academy of Arts in Germany. Originally from Iran and based in London, Tabrizian is a renowned photographic artist and film-maker. She has had a long held interest in considering socially complex questions; migration, youth unemployment, post-industrial cities, the financial crisis. Tabrizian has used such themes to create sublime work that often, as here, explores the act of resistance in the individual, even when that act of resistance might appear passive. Emma Smith is a UK based artist. Smith’s practice incorporates live art, performance and installations, and explores the nature of human relationship and communication through research, collaboration and experimentation. 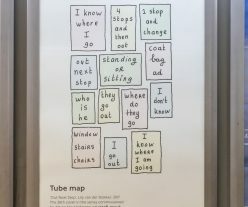 Recent and upcoming projects include: ‘School for Tourists’, South London Gallery; ‘Chorasing’, Delfina Foundation, London (both 2016) and ‘material / rearranged / to / be’ The Curve, Barbican, London (Jan 2017). 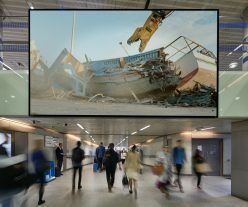 London-based artists Langlands & Bell explore the relationships between people and architecture, and the coded systems of mass communications and exchange that we use to negotiate a fast-changing technological world. They began collaborating after they met at art school in 1977. Their work ranges from film and digital media projects to sculpture, installation and full-scale architecture. Within an aesthetic framework, it focuses on the structures we inhabit and the networks that connect them, while reflecting at a wider global level on the many ways space is encoded as social, political or economic territory. 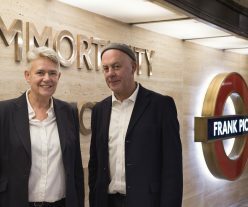 Langlands & Bell commemorated Frank Pick’s iconic designs with a permanent memorial in Piccadilly Circus station, titled ‘Beauty < Immortality’ marking the 75th anniversary of Pick’s death. Matthew Raw is an artist based in Hoxton at Studio Manifold – a collective he began alongside fellow Royal College of Art graduates in 2010. His varied practice spans exhibitions, residencies, education and commissions. 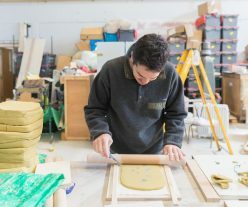 He makes work predominately out of clay, and has recently focused on handmade tiles. 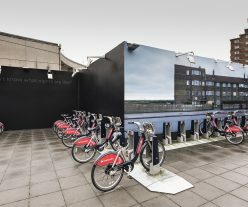 ‘The Shifting Spirit’ – an imagined but full-size installation of an East London pub facade – alerted Assemble to work with Matthew to clad the kiosk at Seven Sisters Station for their Underline project. Tackling politics, religion, war and history, Broomberg & Chanarin prise open the fault lines associated with such imagery, creating new responses and pathways towards an understanding of the human condition. Trained as photographers they now work across diverse media, reacting to the photojournalistic experience of being embedded with the British Army in Afghanistan (and the controlled access to frontline action therein) with an absurd, conceptual riposte, composed of a series of abstract, six-metre swathes of photographic paper exposed to the sun for 20 seconds, for the work The Day Nobody Died (2008). Through painstaking restitution of found objects or imagery, for example the long-lost set of the film Catch-22 which was exhumed by the artists in Mexico for their work Dodo (2014), Broomberg & Chanarin enact an archeology or exorcism of aesthetic and ideological constructs behind the accepted tropes of visual culture, laying bare its foundations for fresh interpretation. Language and literature play an increasing role as material for their multifaceted work, from the philosophical underpinnings in Bertolt Brecht’s War Primer to the sacred texts of the Holy Bible itself, both books having been refashioned and recreated by the artists in their own ambiguous, combatant image. Assemble are a collective based in London, nominated for the 2015 Turner Prize, who work across the fields of art, architecture and design. They began working together in 2010 and are comprised of 18 members. Assemble’s working practice seeks to address the typical disconnection between the public and the process by which places are made. They work in a way that is interdependent and collaborative, embracing direct action and a DIY sensibility. Their projects often deploy unconventional means, are self-initiated self-made or self-organised, subverting typical hierarchies and procedures surrounding the realization of architectural spaces. 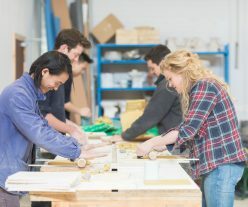 It’s a refreshing and playful approach, which provides a stark contrast to the homogenous urban landscape which unfolds under processes such as design-and-build, and post-recession strategies of regeneration and gentrification, processes which often embrace development over quality of design, social concerns, or suitability for public use. Within this context, Assemble’s work tries to be critical, reflective, joyful and above all, useful. Jacqueline Poncelet established herself as a major figure on the international ceramics scene in the 1970s and 80s. In the 1990s she diversified her practice to include painting, sculpture and public art commissions, ending the decade as one of the three curators of the British Art Show. She has had numerous solo and public exhibitions both in the UK and abroad, and has won a number of awards.